Investing in a hybrid car is possibly one of the wisest decisions any driver can make. Not only are you investing in a handsome, high-performance vehicle that will save you money, you are also investing in the environment. Unlike regular vehicles, hybrid vehicles are 20-35% more fuel efficient and have can decrease harmful emissions between 25-35%. And to add to the many benefits, purchasing a hybrid vehicle can even grant many drivers a tax break, saving them up to $3,400 in taxes. 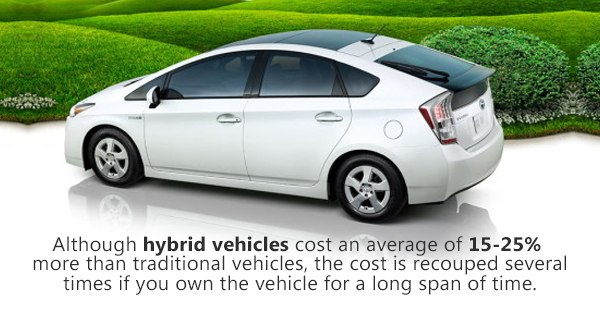 Indeed, the price tag on a hybrid vehicle can be a touch higher than an average vehicle. In fact, you should expect to see a 20% spike in upfront ownership costs, with the cheapest hybrid pricing in at about $20,000. But what you pay upfront, you certainly make up for in the mileage you save. As previously stated, hybrids are 20-35% more fuel efficient than your average vehicle, so think about how much money you’ll save on trips to the gas station! Typically, hybrid battery packs do not outlast the car itself. That being said, owners should think ahead about replacing a hybrid battery. This replacement is often necessary between six and 10 years after the car’s initial purchase. Five years into owning your vehicle, you should start thinking about hybrid car battery replacement. Knowing how to get the best MPG will also extend the batteries in hybrid cars. Tips include easing on and off your breaks and maintaining a consistent speed while on the road. When the time comes for replacement, do research online to find the best deal possible, as some batteries can be extremely expensive. Your hybrid car will be one of the best investments you make as a driver. Don’t be afraid to make the call!